Can we change the text of the generic NaA comment in the Low Quality Posts review? This does not provide an answer to the question. Once you have sufficient reputation you will be able to comment on any post; instead, provide answers that don't require clarification from the asker. This looks like something that was copied in from SO. The issue I have with it is whenever I use it, I have to remove the entire last half as it is basically never applicable. This does not provide an answer to the question. Once you have sufficient reputation you will be able to comment on any post. 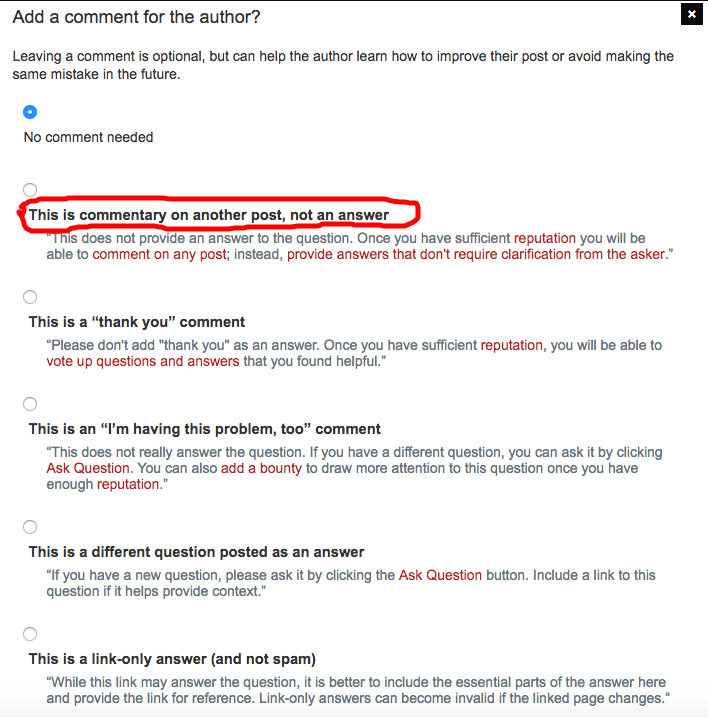 I understand sometimes we have answers that necessitate the current comment, but by and large, SFF questions spawn answers that are comments acting as "answers", not comments acting as questions. As has been mentioned elsewhere, random comments posted as answers don't necessarily need an auto comment. However, given the title in the popup (see below), I feel this is misleading to anyone who is unfamiliar with the system (and even for those who are). I recommend changing the text to my truncated version, or replacing the removed portion with text more appropriate to the type of comment-answers we see on SFF. Browse other questions tagged discussion comments review-queue . How to comment on “There is no in-universe answer”/“plot hole” answers lacking any evidence? Why can't I post a comment anymore? What measures have been/can be taken to guide guests & new users with respect to the rep requirement to comment? When should 20kers vote to delete an answer? Do we want Smoke Detector to auto flag spam?